UTC receiver Joseph Parker breaks a tackle by Wofford cornerback Devin Watson during their SoCon game Oct. 6 at Finley Stadium. CULLOWHEE, N.C. — Time and time again, Joseph Parker has proven to be a valuable target for University of Tennessee at Chattanooga quarterbacks. In the Mocs' 26-6 win at Western Carolina, Parker finished with 48 yards on three catches, including his first two touchdowns of the season. The 5-foot-10, 185-pound senior has prided himself on avoiding dropping passes to the point that junior quarterback Nick Tiano noted Parker would be "in a bad mood all week" if he doesn't have the sort of production he expects from himself. "I'm probably the maddest person you've ever seen when I drop the ball," Parker said. "That's something I never do, so when it does happen, it eats me up because you've got to be sure-handed, and that's what I believe myself to be. That's what I work to be, so when I drop it, it irritates me to the core." He was sure-handed against the Catamounts (3-3, 1-3 Southern Conference), making an over-the-shoulder catch on a fade pattern for the first touchdown of the game. "He's had plays like that. Made plays like that," said UTC coach Tom Arth, whose team enters its off week 5-2, 3-2. "He's such a smart football player, so instinctual. We really trust him in a lot of those situations." Parker's 29 catches, 333 receiving yards and two touchdown receptions this season rank third on the team behind Bryce Nunnelly and Wil Young, aiding a passing attack that has averaged 258.7 yards per game to rank third in the SoCon. Parker has built a relationship with Tiano since arriving in the 2017 preseason, when both were transfers — Parker from Wyoming and Tiano from Mississippi State. Parker became Tiano's top target early with 12 catches in the first two games last year. "The big thing with Nick is that we're great friends off the field, but we put so much work in together and we have a big trust factor that he can go put it somewhere and I can go make a play on it," said Parker, who has made valuable contributions while lining up in the slot. "That comes with reps, reps, reps, but we've built a friendship through that. We've just taken it to another level." 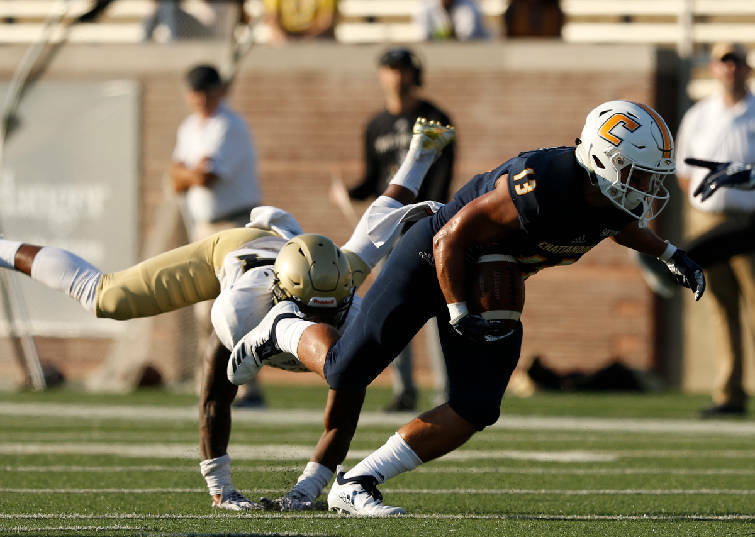 UTC has struggled on offense at times this season, especially on the ground, but the Mocs committed to the run Saturday and rushed for 144 yards against the Catamounts. That's their second-best total this season and third-best in Arth's two seasons as coach. If the Mocs can continue to establish the run, it will lead to more opportunities for big gains by breakout sophomore Nunnelly, who ranks second in the SoCon in receiving yards per game (116.7) and receptions (52). It will lead to more opportunities for athletically gifted senior Young, who ranks seventh in receptions (32) and 10th in receiving yards per game (49). But it will lead to more opportunities for Parker as well. "Joe's an extremely smart football player. That's his biggest strength," Tiano said after Saturday's win. "He's a great receiver. He's not a freak (athletically), but he knows the game, understands how to get open, and I've got a lot of trust in him. Since he's been here we've put in so much work on our own, it's unbelievable. "It was great to see him get a couple (touchdowns) today."